Heat oil in a large cast iron skillet over medium-high heat. Saute onions until translucent, about 5 minutes. 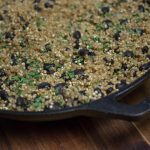 Stir in quinoa, black beans, salsa verde, chicken broth and seasonings into skillet. Reduce the heat to a simmer and cook for 20 minutes or until quinoa is tender and liquid is absorbed. Fluff quinoa with a fork. Serve immediately. Even though I used salsa verde feel free to use your favorite salsa instead.